Windows 8 Failures +The End of Retail Version??? If Microsoft no longer sells full retail versions of Windows starting with Windows 8, as rumored, don't expect many tears to be shed. If this pans out -- and so far, I have heard it from only one source (as I noted on the Windows Weekly podcast with my co-host Paul Thurrot this week) -- I doubt there will be anyone lining up in protest. In Microsoft parlance, a full product typically means a non-upgrade, fully licensed version of Windows sold in a box via brick-and-mortar and/or online retailers. With Windows, full product tends to be quite expensive -- and not very popular, as most users get their Windows either preloaded on new PCs, via volume-licensing deals, or as an upgrade to an existing version of Windows. Very few users want or need a complete, new copy of Windows for a machine on which Windows has not been previously installed. Those who typically have wanted and needed full Windows product -- among them, do-it-yourself PC assemblers -- will now be able to buy a system builder license for Windows 8. Microsoft officials have said the DIY crowd and those installing Windows 8 in a virtual machine or separate partition will be able to purchase a Windows 8 Pro System Builder version. There's no official word so far on the price of that SKU. There's a bit of confusion among some system builders because hints regarding the new do-it-yourself (DIY) system builder license for Windows 8 seem to imply that those purchasing Windows 8 this way will only be able to obtain five copies per system builder for commercial use. For smaller PC makers, sometimes called white-box vendors, this limit is impractical. This limit also could hit companies whose IT departments may want to build their own custom PC systems. Microsoft representatives are not commenting on anything to do with Windows 8 packaging, pricing, licensing and distribution plans beyond what they have disclosed publicly already. The company did say this week that Windows 8 is on track to be released to manufacturing (RTM) by the first week of August. It will be generally available by late October, 2012, officials added. "The majority of consumers buying the retail license are looking to upgrade. For Windows 8, Microsoft will therefore only offer an upgrade version of Windows 8 through the retail channel. This is the license an end user would purchase who wants to upgrade their current PC from a prior version of Windows to Windows 8." re: Windows 8 Failures +The End of Retail Version??? Metro Mail has the skeleton of a good client, but hasn't been fleshed out. Windows 8 Mail looks pretty in the right light, but is missing lots of important functionality. When the Windows 8 Consumer Preview landed at the end of February, the Metro-style e-mail client seemed like one of the strongest tools among a sparse and limited set of applications. Microsoft shipped a few apps to show off the transport-inspired Metro interface that will dominate the next generation of Windows PCs and tablets—but cautioned that none of them were really ready for daily use. The simplified interface of the Windows 8 e-mail client seemed promising, like the shell of an application that could become very good if given the proper care. With the right improvements, it might eventually end up as a good option for tablet users, comparable to the mail client in Apple's iPad. But Windows 8 is for both tablets and desktops—and the latest version of the Metro mail client is not close to being ready for desktop power users. Whether used on a tablet or desktop, we think Metro Mail in its current form will have users pining for a real desktop application. Unfortunately, Windows 8 Mail just didn't improve much between February when the Consumer Preview came out and in late May when the more advanced Windows 8 Release Preview shipped. We are less than one month from the final version of Windows 8 being released to manufacturing, with actual Windows 8 devices set to go on sale in late October. The e-mail client will continue to improve, but what's in the Release Preview isn't likely to differ dramatically from what ships with Windows 8's retail edition. So it's time to give the client a more critical look than we did in its first go-round. Because they are frequently bought by consumers but used for work, tablets are expected to provide a built-in e-mail client for accessing both business and personal messages. Microsoft is obliging by putting Exchange support in the Mail client for Windows 8, but has put itself in a bit of a difficult position. Windows 8, Microsoft says, will provide all of a consumer's or professional's tablet and PC needs, in both touchscreen and keyboard-and-mouse modes. But if the Mail client Microsoft provides free to tablet users works just as well in PC scenarios, it's one less reason to buy the pricey Microsoft Office and its included Outlook mail client. For the basics of reading and replying to e-mail, displaying folders, moving messages between folders, sending and receiving attachments, and such, Metro Mail works well enough. The interface is definitely optimized for touchscreens, much like the mail clients on the iPad and Android tablets. For mouse-and-keyboard users, the Metro Mail client exceeds the equivalent program for Windows 7 in some respects, but lags behind in overall functionality. Neither one ends up being an ideal option for desktop users. 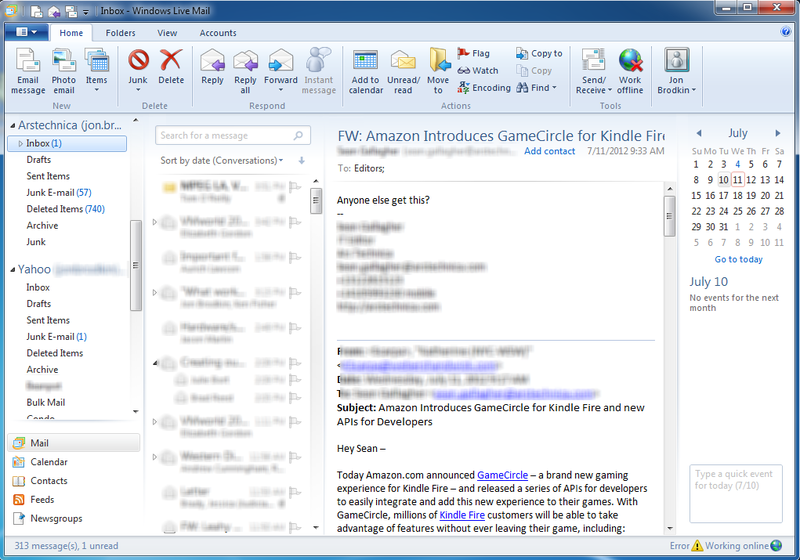 Windows 8 Mail provides a three-pane view. The left-most pane can show either your accounts or the folders in one account. Windows 7 doesn’t come with a mail client pre-installed as Windows 8 does. Users who want a free e-mail application for connecting to webmail accounts can download the desktop program Windows Live Mail. The Windows 8 Mail client also drops the calendar integration found in Windows Live Mail, another decrease in functionality. The overall experience is harmed as the client just seems to be missing random features, like the ability to flag a message for followup. An option to mark messages as junk or spam also seems to be missing (although you can manually move a message to the junk folder). On the message flagging issue, a Microsoft representative pointed out to us that you could set up a folder to file important e-mails away, but said flagging isn't possible in the Release Preview. Microsoft couldn't say if it will be addressed by the time Windows 8 is released to manufacturing. A Metro-esque version of Outlook is known to be in the works, but while businesses typically buy Office for their employees, home users are a lot less likely to make the purchase on their own. As Windows 8 tablets will inevitably be compared to the iPad, it would help if Microsoft could exceed the iPad's mail app in functionality. That hasn't happened yet. While the iPad mail client doesn't offer major integrations with the calendar, the iPad pushes meeting requests and alerts to the user no matter which app they are in, and the user can respond without leaving the current app, making the lack of integration much less problematic. It would probably be easier to list the e-mail clients that don't support flagging messages for followup than the ones that do. But for the purposes of this article, we must note that the Windows Phone e-mail client supports flagging. 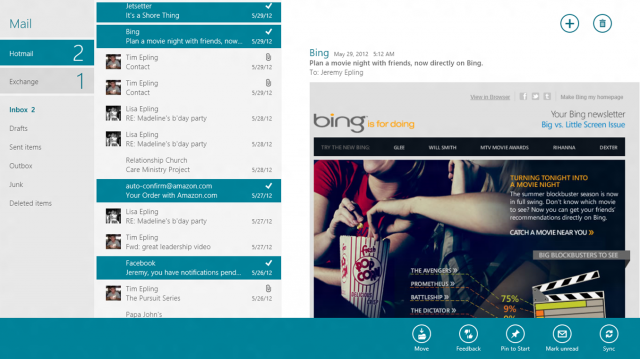 Windows Phone also supports IMAP, POP, and Exchange Active Sync. In these respects, Windows 8 Mail is feature-deficient compared not just to other desktop and tablet apps—it's behind Microsoft's own phone platform. The Release Preview has also led to users reporting frustration over the Mail client being unable to connect to servers using self-signed certificates. This could be a problem for businesses that issue their own private certificates, or even individuals who host their own mail servers. UPDATE: One reader asked if Windows 8 Mail lets you view your inbox while composing a new message or replying to a message. The answer seems to be no—composing a new e-mail brings up a window that covers the rest of the application. This limitation is also true of the iPad e-mail client. Unlike the iPad, Windows 8 does let you view the windows of multiple apps side-by-side (so you could have Mail and a word processor or browser viewable at the same time, for instance). But compared to most desktop programs, the inability to compose e-mail while viewing your messages list is one less option for multi-tasking. Given the limits in functionality in Metro Mail and the fact that the Windows Live brand is being de-emphasized by Microsoft, we wondered if the Live Mail client would remain an option for Windows 8 users. At first, Microsoft told us simply that Live Mail will continue to work on Windows 8, without specifying whether that only applies to users who upgrade from Windows 7 to Windows 8 and transfer their applications. More important is whether Microsoft will continue to make Windows Live Mail available as a free download, and will continue updating and supporting the application for users of Windows 8 and earlier versions of the OS. With a little more prodding, Microsoft gave us some good news: "Windows Live Mail will continue to be offered as a free download to customers of Windows 7 and Windows 8," the Microsoft representative said. It should be noted that while Live Mail will work on Intel-based Windows 8 devices, it won't work on ARM tablets, which use a special version of Windows 8, called Windows RT, that excludes traditional desktop applications. Major updates to Windows Live Mail probably aren't to be expected. Microsoft certainly wants to sell customers on the Metro mail client—if something as important as e-mail can be converted to Metro on the desktop, it’ll be that much easier to convince users of Metro’s overall utility in traditional keyboard and mouse scenarios. It wouldn't really be fair to compare Metro Mail to Microsoft Outlook, as that's a professional (and pricey) e-mail client that should (and does) outstrip the capabilities of any free program. But it makes sense to compare the Metro e-mail client to Microsoft's own Windows Live Mail. In setting up e-mail accounts, Windows 8 Mail takes one step forward and another back compared to Windows Live Mail. For the types of accounts Windows 8 Mail supports (namely, Exchange, Gmail, and Hotmail), the auto-discovery works like a charm. Connecting to your employer's Exchange Server and accounts like Hotmail and Gmail can be done just by entering a username and password. 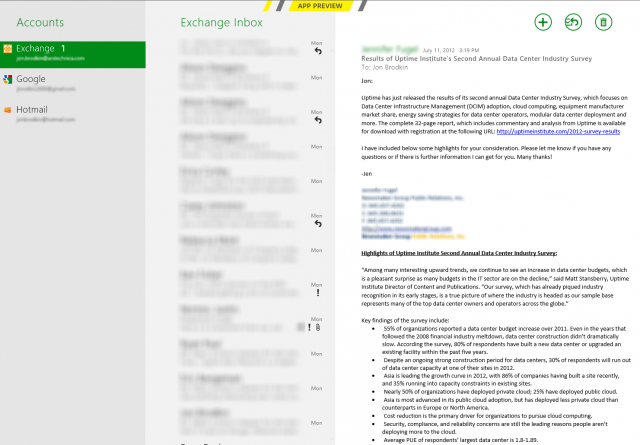 Windows 8 Mail supports Hotmail and Gmail through Exchange Active Sync. But as we noted earlier, it doesn't yet support POP or IMAP, meaning you can't connect to Yahoo Mail or other services that don't support Exchange Active Sync. Adding an account, Metro-style. 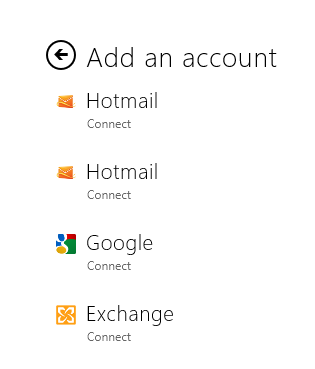 Hotmail has been doubled for some reason. On the plus side, the initial step of connecting to e-mail accounts is a lot easier in Windows 8 Mail than in Windows Live Mail (provided you don't need IMAP or POP). I found the auto-discovery process in setting up my Yahoo Mail account didn't work in Windows Live Mail, forcing me to manually enter the IMAP server settings. Since Live Mail doesn't offer Exchange support, I also had to manually configure the client to point to my employer's IMAP server. I’ve been testing the Windows 8 Mail client in a virtual machine. I tried replicating Windows 8 touchscreen functionality by streaming the VM to an iPad with the Splashtop streamer. Unfortunately, that didn’t provide good enough functionality to make a verdict on the app’s touch capabilities. Ars IT Editor Sean Gallagher is using Windows 8 on a Samsung tablet PC, however, and says the Mail client works well enough on a touchscreen. "The wide-openness makes it much better for touch than on a keyboard. It's meant for quick access to mail, and touch replies, not to be a full client," Gallagher notes. "It works. But if you work in Desktop all the time (which most PC users will), it's kind of a drag to use." The Metro interface is nice-looking to my eye, but by default doesn't present many options besides the usuals like composing and replying to e-mail. More options appear when you right-click just about anywhere, or when you hover the cursor in the top right of the screen to reveal what Microsoft calls a "charm" in the Metro interface. The right-click brings up a tile that lets you switch accounts and decide whether to show or hide the folders associated with each account. It also displays options for moving messages, marking them as unread, and syncing to manually update the message list (just in case it's not updating automatically). The settings charm is where you can add new accounts and decide whether the app should run in the background, notify you of missed e-mails, and whether the Mail app should have access to your webcam and microphone. This is also where the user makes decisions on account-specific settings such as how often to download new messages, whether to download messages that are more than 14 days old, whether to automatically download images, or change the server and SSL settings. Included in that shot is one very important thing you don't get in Windows 8 Mail: Calendar. Live Mail brings mail and calendar tools into one program, letting you write e-mail and schedule appointments from the same program, just as you can do in Outlook. I was surprised there was no Mail and Calendar integration in the Windows 8 Consumer Preview, but figured it would be near the top of Microsoft's list of new functionality to add. But even in the Release Preview, you can’t schedule new appointments without closing the Mail app and going into the separate calendar application. 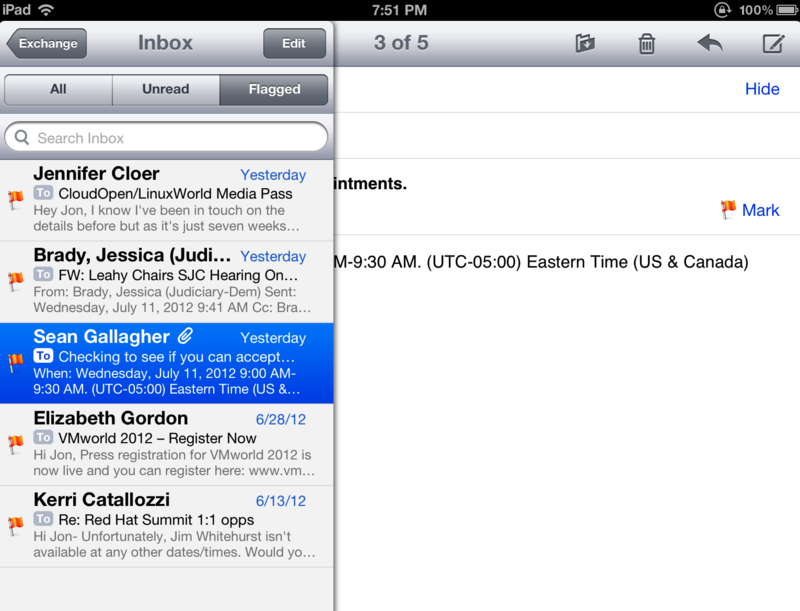 You can't even accept e-mailed calendar invitations unless you close the Mail app and head into Calendar. We asked Microsoft to clarify if there are any integrations between Mail and Calendar today, and what plans are in the works for the final release of Windows 8. "For Mail and Calendar integration, today an invitation to a meeting is sent as an e-mail, but it serves primarily as a notification," a Microsoft representative told us. "You have to go to calendar to accept or decline. That is the extent of the integration as it stands. I don’t have more to share on future functionality, but I can assure that your feedback for integration between the two apps has been heard." Similarly frustrating limitations exist in Windows Live Mail. Because Live Mail puts calendar and e-mail in one program, just like Outlook does, it makes one expect full functionality in both. But Live Mail doesn't support the Exchange protocol, limiting it mainly to webmail accounts. As I mentioned, in Windows Live Mail I can connect to my Exchange account through IMAP, and it syncs my e-mail but not my calendar entries. Just as in Metro, I can't accept Exchange calendar invitations in the Live Mail client, even though I can receive the invitations via e-mail. In this area, both Windows Live Mail and the Windows 8 e-mail client compare unfavorably to Apple's built-in Mail client for Mac computers. Granted, I have found Apple Mail for Macs to be incredibly buggy, so I almost never use it. But it does connect to the major types of accounts, whether it be Exchange, Yahoo, Gmail, etc. It also lets me accept calendar appointments via e-mail, and sync any of the calendars tied to my accounts with the Mac's built-in calendar program. Yes, you can get it all with Outlook if you're willing to pay for it, or if your employer has provided a license. But tablets these days are often bought by consumers and used for both personal and work purposes, and they are expected to work well with corporate e-mail and calendar services. That's why the Windows 8 Mail client comes with Exchange support. But it needs to get better, and the fact that it's intended for use in both touch scenarios and with a keyboard and mouse makes its limitations more noticeable. There's a great, free e-mail client to be had if Microsoft could somehow combine the good points of Windows 8 Metro Mail and Windows Live Mail. Support for all major e-mail protocols, integration between Mail and Calendar, and some sort of interface that works smoothly in both tablet and PC mode is what we'd hope for. All the features of Outlook in a free client is certainly too much to ask, but it seems silly to be missing features as simple as the ability to flag messages for followup. ARM-based Windows 8 tablets are slated to include Office, but Office on ARM won't have Outlook. As mentioned, a Metro-esque version of Office is in the works, which might help out some. But it's not too late for Microsoft to build a great, free e-mail client that's ideal both for touch and keyboard scenarios on Windows 8. If little changes, it won't be surprising to see many Windows 8 customers using two e-mail applications—one when they're holding their device like a tablet, and one when they're using it as a PC. The great tablet/PC convergence Microsoft is promising—for one of the most important applications on both tablets and PCs—remains elusive. Windows 8, the next-generation operating system from Microsoft, is currently available in a pre-release flavor for people all around the world to take it for a spin for free. This is the same approach that Microsoft used for Windows 7, allowing users to get a taste of the product before it even reached shelves, so as to stir their interest. However, it appears that things did not work as planned for Windows 8, and that interest in the pre-release flavors of the operating system was lower than for Windows 7. A recent article on Computerworld, based on data coming from Net Applications, shows that enthusiasm in the next-generation platform is indeed lower than the one for Windows 7 three years ago. Said data unveiled that only 0.2 percent of all PCs in the world running Windows were powered by a pre-release flavor of Windows 8. Windows 8 was present on only 0.18 percent of all computers that went online in June, statistics from Net Applications also unveiled. Compared to that, interest in Windows 7 was much higher in June 2009. The platform was loaded on 0.80 percent of all Windows machines at the time, and accounted for 0.75 percent of all computers. The pre-release flavors of Windows 8 are estimated to have been loaded on around 2.9 million machines in June 2012, from the total estimated global installed base of 1.6 billion last year. In comparison, Windows 7 pre-release powered 9.4 million computers out of about 1.25 billion. Overall, Windows 7 had two to three times higher market share in the first month after the release of each new sneak peak, Computerworld also notes. Windows 8 falls short of Windows 7 from other points of view as well. However, as Microsoft is gearing up for the RTM flavor in early August and the General Availability in late October, things might change in its favor. Well MS should know by now that most people who are going to be the first to use Win8 all know that Win8 is only a Beta Version for Win9. MS needs to remarket there product and give Win8 a proper beta testing. They need to Stop this practice of Releasing Beta Versions as Full Versions and then just fixing up the Errors as they come about. Just think what the out-cry would be if MS produced Cars, they would be out of business before that dust could settle.